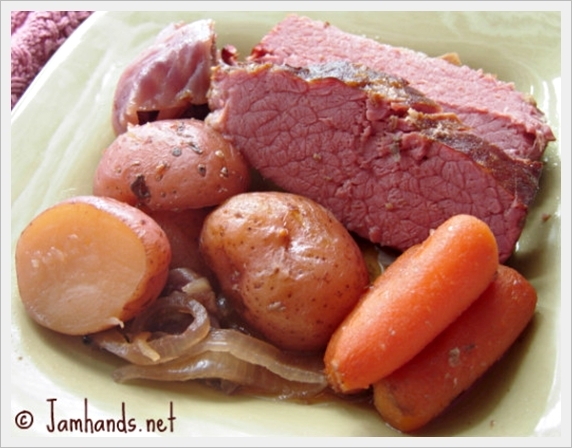 I was a bit skeptical about cooking Corned Beef in the slow cooker, but it turned out great. All of the side veggies tasted delicious, and the corned beef was perfect. Serve this with your favorite bread, I recommend Beer Bread. 1. Place all ingredients in a large crock pot (cut meat in half if necessary); stir to mix. 2. Cook on high for 4 to 5 hours or on low for 8 to 10 hours. 3. Remove meat and vegetables and some of the cooking liquid. 4. Slice meat thinly across the grain. 5. Serve with vegetables and some of the liquid. Another great one for the slow cooker recipe round up! Looks wonderful!